U.C. Davis Aggies Football Teammates Reunite for Happy Living Books’ Celebration of Gratitude & Giving. 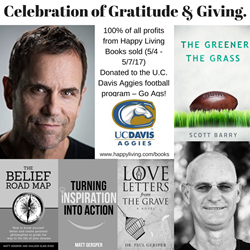 Publisher Matt Gersper, the founder of Happy Living Books, returns to his Northern California roots for a weekend long celebration of gratitude and giving featuring the release of his former teammate’s book, The Greener The Grass, http://amzn.to/2pmeE9B, by Scott Barry. One hundred percent of the profits from all Happy Living Books sold from May 4th through May 7th (at the book signing event, the golf tournament and all online purchases too) will be donated to the U.C. Davis Aggies football program – Go Ags! Happy Living Books is proud to announce the release of the fourth book in its growing library. The Greener The Grass, http://amzn.to/2pmeE9B, is an exhilarating journey into self-realization. Author, Scott Barry, former Aggie Quarterback and alumnus of Walnut Grove High School, shares a deeply personal, hard-earned lesson: to live life with humility and acceptance for what you have in the moment. He writes with raw, uncensored language, exposing his very soul, unprotected by vanity, and with exquisite detail. Scott brings the reader an important message about life, and at times, he is laugh-out-loud funny. Matt Gersper, former Aggie Strong Safety and an alumnus of Del Valle High School in Walnut Creek, returns to Northern California from North Carolina to celebrate gratitude and to give back to his alma mater. Matt launched Happy Living Books (http://www.happyliving.com/books) in January of 2016. Since then, he’s released four titles; The Belief Road Map, Turning Inspiration Into Action, Love Letters from the Grave, and now, The Greener The Grass. On May 3, Happy Living is hosting “An Evening of Gratitude,” a private dinner reception at the Lafayette Park Hotel in honor of Scott Barry for the release of his first book. The former teammates then move on to U.C. Davis to give back some of what the football program had given to them so many years ago. On May 4, The Avid Reader, located at 617 Second Street in Davis, will host a public event beginning at 7:30 PM where Matt and Scott will meet, entertain and inspire their readers, share their personal stories and insights, and sign their books too. On May 5, Happy Living will sponsor a hole and sell books at the U.C. Davis Football Annual Golf Tournament. One hundred percent of the profits from all Happy Living Books sold from May 4th through May 7th (at The Avid Reader, the golf tournament and all online purchases too) will be donated to the football program. Happy Living is on a mission to improve the health and wellbeing of the world, one person at a time. We write to inspire others to take action on their own ideas and to believe that a better self is always possible – today, every day and for the rest of their lives. The Seven Foundations of Health guide our blog, books and talks and is our framework for creating a more meaningful, successful, and happy life. Matt Gersper and a handpicked team of Happy Living Experts practice Happy Living every day and collect ideas to share with you along the way. New members receive a book and inspiring five-minute-to-read blog posts, rousing mini one-man Blog Theatre™ shows, and other special promotions. All these exclusive offers are to help others create a more meaningful, successful, and happy life... delivered right to their inbox once a week. Join us at http://www.HappyLiving.com.